OK, get your thinking caps on. 1. Release the nuts on the top of each steering stem. 2. WITHOUT TWISTING the fork leg, lower it until the roller bearing is visible and free to move. 3. On the lower race, mark where the centre of one roller is (i.e. where the notch is). 4. Move the roller and cage ONE HALF PITCH so that the notch is now equi-spaced between the rollers. 5. Re-assemble WITHOUT TWISTING. The rollers should now be running on a patch of bearing where there is no notch. From various photos of the steering bearings, it looks like the rollers are at about 15deg spacing, which means that you can turn the steering thru about 30deg between notches. So, with this fix you would get smooth turning for 15 deg each side of straight ahead. It's not a cure, but it might be enough for most riding situations. Saves a lot of farting around with grease, brake lines, etc, etc. 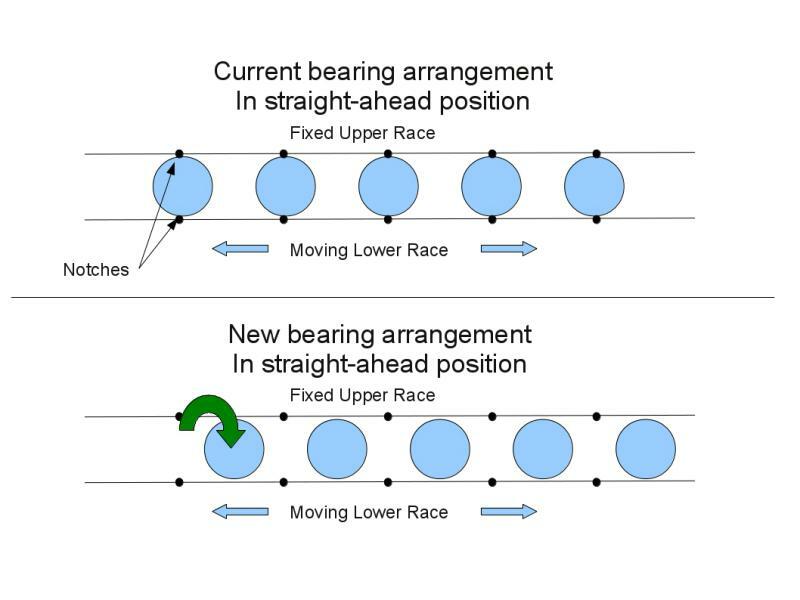 I think you might have the wrong idea about how the bearing rotates within the race... or I'm not understanding what you're saying. The bearing rollers travel over those notches as the assembly rotates. The notch is felt when the bearings roll over the notches and past. If you're saying something else entirely, ignore the above. Let me explain in a different way. In the lower layout, the rollers and cage have been moved so that in the straight-ahead position they are mid-way between the notches. For a movement of the lower race of X degrees, the rollers only move half X in the same direction. So to move a complete roller pitch and fall into the next notch, the lower race has to turn 2 roller pitches. This means there will be a smooth area of operation between notches of 2 x 15deg approx. I think the result of doing that would be the notch is now 15 deg off center (assuming your 15 deg adjustment of the race). I don't believe there is enough spacing between the bearings so that a totally clean section of the outer race is available. I also don't think it would be that easy to move the outer race that is pressed into the fork leg anyways. It would be fun to try out. 15deg off-centre EXACTLY! that's the idea. Spacing between the bearings - well there looks to be about 6 rollers per 90deg of bearing. Sounds like 15 deg to me. Why shouldn't it be "clean"? Move the outer race - NO. I propose moving the ROLLERS. Leave the races where they are because, as you say, they are hard to move. The rollers would be easy. I jacked up the bike and locked the tilt so that one wheel (the one I wasn't working on) was on the ground to reduce unwanted movement. I left the steering link connected. Please excuse the bad focus I didn't have my glasses on when I took it. Anyway, I marked the position of one of the bars of the cage (because it was easy to see) with correcting fluid. See white marks above. Then I jiggled the front end a bit until I could push the bearing around to the position shown below, with the roller now lined up with the white marks. I locked up the nuts as per procedure. did the other side the same way, and re-assembled the bike. Then I went for a ride. Took me about an hour and cost.... NOTHING. Like the way you think brotha! Well there you go, best way to find out if it works is to give it a try. And now I'll probably try to do the same thing myself! I'll let you know if it works for me. Having never closely examined this portion of the scooter, may I restate what you did? You marked the "blank space" between (any) pair of rollers. While having the tension on the races relieved (by loosening everything up and having the fork hanging free), you shifted the rollers until (any individual) roller was under the mark you had made, then tightened things back up to lock the rollers into their new position. 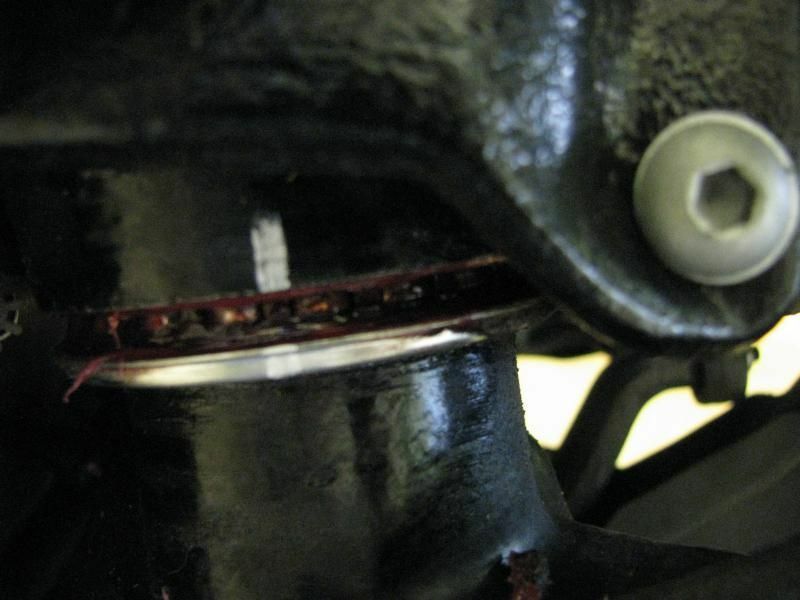 Doing this means that the rollers are now in a different position than the detent (notch) that was causing your steering difficulties, so the notch's effects would not be felt unless the handlebar is turned so much (low-speed non-countersteering turn) that the bearings are back over their original positions. Doesn't this mean that the notch issue shows up in the middle of turns now? >Doesn't this mean that the notch issue shows up in the middle of turns now? See my question directly above. As I understand it, this would only happen during turns involving rotating the handlebar's physical position, which only happens during low-speed, non-countersteering turns. I presume the thinking is it's better for it to happen at 3mph than 60mph. Outstanding man! That is certainly better than dropping a boatload of money on the problem. In addition most people may not be aware that to actually do teh job involves cutting wires and tubes and resplicing. Nothing is ever as good after that. I think the naysayers are thinking 15 degrees isn't enough. Most turns that are affected by the notch are small and at slower speeds - filtering, city driving. That's what makes it so bad. 15 degrees is more for higher speeds and steeper turns where the forces actually work in your favor to overcome the notch at the ends of this range. I'd say this is a real win for the problem because we *know* that it will eventually happen. Now there's an inexpensive workaround. Not a true fix but a workaround that may delay the expensive repair at minimum. Again, when you are countersteering the handlebars are not actually turned, correct? The higher the speed, the less the steering mechanism actually turns. Exactly - you cab in fact lean like a mutha when you take a corner hot - yes your steering is turned quite a bit, but I bet still less than 15 degrees. Furthermore - the notch is a PITA because you are trying to roll it out of teh hole from a straight on path to a turn. The bike is resisting this anyway and adds to the resistance of the steering notch. At the 15 degree "ends" however you have the forces working *with* you to get it out or past the notch. I personally give it my bloody brilliant award. One thing I did not think of. If you have the notch, you only feel it when the roller is in it right? Well if there wasn't enough room between the rollers for GonzoB's fix then you would also feel the notch when you moved the handlebars to either side far enough so that the next roller fell into the notch. So in other words you would feel the notch in two places when turning the handlebars fully from side to side. But you don't, you only have the notch when the bars are centered ergo there must be enough "clean" race available between the rollers to do this fix. I'm going to do it as soon as I look up the new torque specs again. Well done GonzoB. If it holds up, that's some of the best news in a while. Definitely bookmarking this page. Hats off to Gonzo!! Why do wires and hoses have have to be cut?? Never read that in any of the posts I have read. Only wires going to the front are the wheel speed sensors and they just unplug from the sensors at the wheels and hoses have fitting right where they mount to the front suspension. Please explain or give links. The mechanic who did my first bearing change did not cut the wires, I'll have to ask him how it did it again but I know the wires were not cut. Just got done with the GonzoB fix and it worked for me! I took the scoot out on the street for a quick maneuvering exercise (couldn't go too far, the plastics and lights weren't installed) and did low speed U-turns, weaving back and forth and whatever else I could think of to give me maximum steering movement. Not a sign of the notch during any of it. I believe that it was only the right side that had the notch, I started on the left and didn't see any real improvement until I got to the right bearing. Well done to GonzoB! Have a thumbs up! BTW I had to eyeball the tightness of the upper and lower nuts, I don't have any tool that could allow a torque wrench to work in that space so I just drifted the lower nut tight and the upper ring a bit tighter, I go back and check them again in a few miles. I also found that all I had to do to move the bearing was to turn the handlebars back and forth, with the nuts loose there was enough play for the bearings to move and once I got the roller in the position needed (making sure the handlebars were centered) I lowered the suspension back to the ground and tightened up the lower then upper nuts. The bracketmeister has it in one. I hasten to add that this works only ONCE. The gap between rollers is not very great and it would be difficult to "split the notches" again. I think it gives an opportunity to have a second life and start the clean section of bearing with the right pre-load and fully greased. Mine was not like this from new and although I re-set the pre-load/greasing after about 3000km, I think the damage was already done. Thanks for all your kind words, but let's wait and see if it causes other problems. However, I have to say that I'm pretty happy with the result. Zinfan, I think what you're not feeling is the fact that the notch is a subtle effect. I could only feel mine when I was coming up to a stoplight in a straight line. I guess it wasn't very bad. I certainly couldn't feel it when turning the handlebars when stopped, or even when I had the front end jacked up. Yes, you should be able to feel it ~30deg to left or right, but, usually when you're doing that, you're making a tight turn and subtleties are the last thing on your mind. 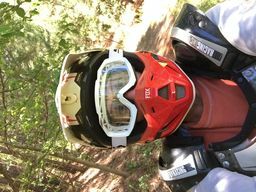 Believe me my notch was very noticeable, I could feel it just by turning the handlebars side to side and when riding slowly it was also prevalent. After the fix it is gone no matter how far I turn the handlebars. Scroll down on the second page in this post and look at the step by step procedure, doesn't say anything about cutting wires or hoses. I have it printed out for the dealership. Man - your dealer needs a MV printout for this job I'd be worried. Since I'm too lazy to go out and look or search for it here - my memory tells me that there are at least two hydraulic hoses going down that tube. I think one is the brake and the other the hydraulic lock. Maybe the wires I was thinking about just go along side - I think maybe the speed sensor. Anyway - I'm damn near 99% sure both of those hydraulic lines were stuck through by hand then the final fittings spliced in place. One I think makes damn near a 90 turn right out of the end. I remember this because I was thinking how much room was available to loosen up the tubes to inspect the bearings. Anyway - pretty sure I'm right that the original post on replacement of the bearings involved those hydraulic lines needing to be to be cut and refitted. But hey, I'm sure those boys will figure it out no need to worry. EDIT: I dug out the pictures from the manual. It appears that the lines do not have to be cut but they *do* have to be completely removed. There are two banjo fittings at the top for the hydraulic lock and brakes. They have to be completely disconnected top & bottom & removed to replace the bearings - there isn't enough room to just undo once side and move them. I seem to recall that 6+ hours was required labor if they know what they're doing. I'm not sure that includes bleeding those two hydraulic systems too. What a job! Easier to try Gonzo's idea for sure! This is my one chance for fame and fortune. MP3 400, 2008 build, purchased 2009 ex demo. We now know that the proceedure fixes the notch problem. for at least as long as it took for the problem to first arise. Why not carry out this easy proceedure before the problem arises as a preventative measure? That would very nearly double the life of the bearings. Of course, the trick would be to carry out the work as close to possible to the first sign of wear in order to maximise the total 'fix'. I am uncertain if the ball-race wears in addition to the outer carriers - no doubt others will know. That could well be possible due to uneven pressure on the bearings. If in fact that is the case, then a 180 degree turn of the ball-race, when carried out as a preventative measure, would also aid in extending the total time & life before bearing failure. It's a great idea and fix that Gonzo has thought up and tested. More than a great idea... It is the Gonzo Tweak. Buenos Notches - say goodbye to bearing problems with the Gonzo Tweak! Maybe we should have a contest..
how about " doin the Gonzo "
Man - your dealer needs a MV printout for this job I'd be worried. The job is a 12 hr job the first time from what I have read. I am planning on slipping the mechanic $200 and telling him to take his time. I turned wrenches for years and know you start rushing and get frustrated when you are losing money on a job like this. Thanks for thinking this out and following through, Gonzo. Smartly done! Nice to have this option! I guess I was having trouble relating because I haven't had the issue come up yet. I guess it might not be an issue when cornering because you've got so many other forces at play then. I'm sure it'll be an "ah-ha" moment when I do come down the the notches. Either way, I'm glad you came up with this. 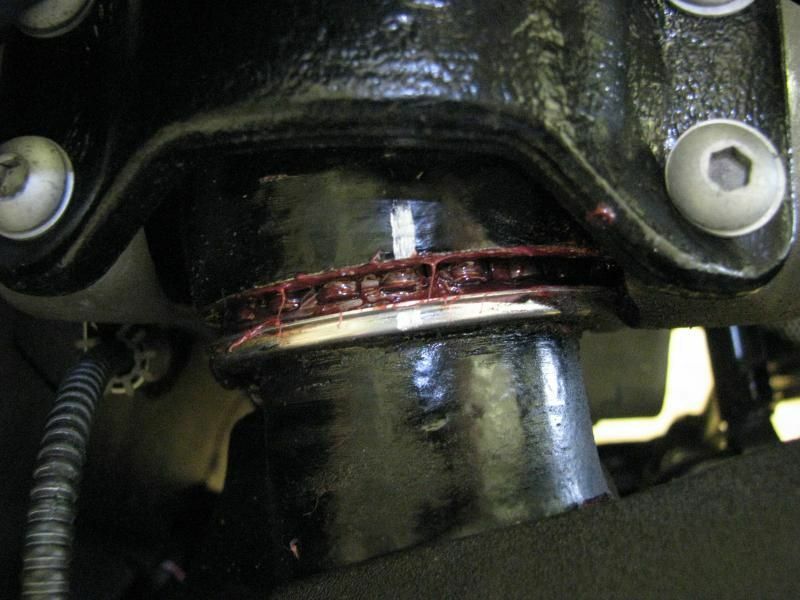 I think that re-tightening to the specified torque that the service bulletin specified would help prolong the notch appearing on the shifted surfaces of the races. Good thinking! I submit "Notches be Gonzo!" or "doing the Gonzo Twist"
sounds like this weekend we are going to be doing this during our weekend gathering in the smokies, as a maintenance item for folks to see. Edit : Gonzo has this holding up for you? How did I miss this thread. Great idea Gonzo!